Manchester City may have cut Liverpool's lead at the top of the Premier League to two points with victory over Arsenal, but Pep Guardiola says all the pressure is on his side. City suffered a shock defeat to Newcastle United last week and, combined with Liverpool's draw with Leicester City, the Reds moved five points clear at the summit. With Guardiola's side playing a day before their rivals this weekend, they took their opportunity to move back within striking distance as the Gunners were beaten 3-1 – Sergio Aguero netting his 10th league hat-trick for the club. 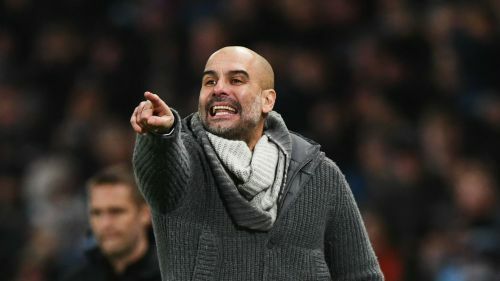 However, despite claiming all three points, Guardiola insists there is still no pressure on Liverpool as they prepare to face West Ham on Monday. "I prefer to be in Liverpool's position rather than where we are," he told reporters. "The pressure is when you're behind. If you lose points, it's tougher. When you're top with distance you can lose points and still be there." He has not given up hope of usurping Jurgen Klopp's Reds, though, as they enter the final months of the campaign. "Of course we have to win a lot of games," he added. "After the Newcastle defeat everyone thought we would go seven points behind. But everyone expected Liverpool would win against Leicester. "A lot of things are going to happen between now and the end of the season. It will be tough. But football is unpredictable. Now we are two, tomorrow it can be three, five again. "I'm not in the mind of Jurgen and the players. Every press conference you say, 'Put pressure on Liverpool'. I don't know. We have to be ourselves. That's the main target we want to achieve, and win our games. "I cannot deny that we'd prefer West Ham beat Liverpool, of course. But Liverpool would have preferred Arsenal beat us. That is normal. But I don't have influence on that."